This piece was cross-posted on Jewesses With Attitude, the blog of the Jewish Women’s Archive. Click here to read it there. New Yorkers know better than to bother an actor, celebrity or otherwise famous person when they see one on the street (or in a restaurant, store, or park – not to mention stepping out of a taxi). As a New Yorker for fifteen years, I upheld this unwritten rule – even when it came to a famous neighbor. And now, realizing I missed my chance to get to know better a woman who changed an important aspect of life for thousands, if not millions, of people, I regret my reluctance to rebel against convention. I also now know that I allowed my own insecurity (unrelated in any way to Big Apple etiquette) to get in the way of my understanding history from someone who changed it. 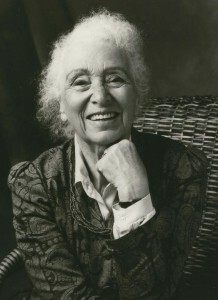 For ten of my fifteen years in Manhattan, I lived literally next door to Elisabeth Bing, a pioneer in educating parents for pregnancy and childbirth and co-founder of the the American Society for Psychoprophylaxis in Obstetrics (now Lamaze International). Bing, an immigrant of German-Jewish descent who was educated in England upon fleeing from the Nazis, lived for decades in an apartment building on West 79th St., where she operated a center/studio on the ground floor of the building, at which generations of Manhattanite new parents prepared for the birth of their children under her tutelage. It is only today, years after I gave birth to my sons who are now teenagers and after doing some research, that I have come to fully realize the mark my elderly neighbor has left on social and medical history. As a young, busy, working mother, I was satisfied to leave my relationship with Elisabeth (she asked that we call her that rather than Mrs. Bing) at the level of friendly banter in the hallway outside the elevator and to an occasional visit by my children to her apartment to play with her cat. I knew that this compact, energetic octogenarian who always wore her frizzy white hair tied back in a pony tail and moved at a clipped pace, taught childbirth lessons. What I failed to realize was how influential she was, and how tenacious she had been in pursuing her interests and developing her field. As a young woman, Bing saw what she perceived as a wrong and set out to right it. While training as a physiotherapist in England prior to, during, and immediately following WWII, she worked with bedridden new mothers on gaining strength in their muscles. This exposure to the then practice of obstetrics whereby childbirth was treated as an unnatural condition, women were drugged and asleep during childbirth, and new mothers were strictly confined to bed for ten days following delivery compelled Bing to seek out and study alternative approaches. Having known her as an older woman, I can imagine how in those early years she used her confident air and intelligent-sounding British-German accent to convince doctors at New York’s Mount Sinai Hospital (coincidentally, where my sons were born) to take the risk of allowing her to work with their patients and set up Lamaze Method pregnancy and childbirth education programs. Bing’s success in New York led her to gain notoriety throughout the country and even internationally. She lectured widely, wrote articles, contributed to several publications, and published her seminal book, Six Practical Lessons for an Easier Childbirth in 1967 (available for your Kindle over forty years later!). Countless Lamaze instructors trained under her, and innumerable new parents learned from her. “Life just sort of took me into it. It wasn’t that I had decided once I was in this country that this was what I was going to do. Things just happened, and I was there at the right moment, and I stayed with it,” she once said modestly in an interview. 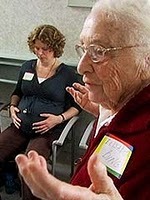 Elisabeth Bing leading a breathing techniques class. I was one new parent who chose not to learn from her. Wary of natural childbirth and afraid of being made to feel uncomfortable because of it, I shied away from Elisabeth’s classes (despite the alluring convenience of their being held in a studio off my building’s lobby). Already having received dirty looks in the pediatrician’s waiting room for bottle-feeding my first son, I – by the time we moved into our apartment on 79th St. and I became pregnant with my second son – was sure that my lack of earthy-crunchy credentials would just result in tsk-tsking (if not outright scorn) from the other couples in the class and worse yet, from Bing herself. It turns out that I had been wrong. Elisabeth came over to our apartment to check on me after I arrived home from the hospital. I sheepishly told her I had had an epidural and that my labor had been augmented with drugs. She saw me lying there in bed bottle-feeding my newborn. The mother of Lamaze handed me a blow-up rubber donut to sit on, congratulated me and was nothing but reassuring and gracious. Elisabeth was interested in helping new mothers, not judging them. I may not have taken Bing’s childbirth class, but I suppose that in the end I did actually learn from her. I learned that I could have gotten to know this fascinating woman better, and that going forward, I would never again let any self-consciousness stand in the way of my getting to know interesting people I might have the fortune to meet. I have put Elisabeth Bing “On The Map” on the Jewish Women’s Archive website. I invite you to see her there, and to add your own landmarks relating to Jewish women’s history to JWA’s map. A version of this post was published today as “Why Abbie Dorn Deserves to See Her Children” on the Sisterhood blog of The Forward. Click here to read it. A vibrant and healthy Abbie Dorn prior to the botched delivery of her triplets. When I look at Abbie Dorn, I see my late friend, Risa Hirt. 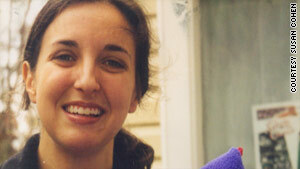 Abbie Dorn is the 34 year-old, severely incapacitated, Orthodox woman whose tragic story has been in the headlines recently, as her parents fight on her behalf against her ex-husband in the courts. They are fighting for Abbie’s right to have her children, triplets born in June 2006, visit her. Daniel Dorn, who divorced Abbie a year after she suffered apparently irreparable brain damage following her delivery of the children and is raising them in Los Angeles (Dorn is being cared for by her parents in their home in South Carolina), is arguing that the triplets’ seeing their mother in such a state would be distressing for them. He says he would be open to their seeing their mother when they are older, but only if she were able to communicate with them. The case is going to trial on May 13 and could become a legal landmark for the rights of mentally incapacitated parents. I can’t help but view Dorn’s case, through the prism of my, as a teenager, watching my friend Risa rapidly waste away from an early-onset, rapidly progressing form of Multiple Sclerosis. The situations are not exactly the same, but for me, the lessons learned are. Those lessons are that try as you might, as Dorn’s ex-husband is attempting with their 4 year-old triplets, you can’t shield children from the less-than-happy aspects of life. In fact, doing so can be detrimental to them, depriving them of the opportunities to develop into compassionate and moral human beings. Life can be confusing, hard and disturbing, but it is through these kinds of experiences – far more than through the easy ones – that we grow. To be sure, some credit is due to our parents and teachers. But it was the time my schoolmates and I spent with Risa that taught us the most about what it means to be a good Jew and a good person. It is thirty years later, but I still vividly remember the boys carrying Risa in her heavy wheelchair up three flights of stairs to the classroom and the girls helping her in the bathroom. She quickly deteriorated from walking unsteadily to being non-ambulatory and constantly shaking, unable to control her muscles, but no one doubted her place alongside us. Once Risa was no longer able to go to school, we visited her at home in the bedroom her family set up for her on the first floor of their house. Her hospital bed was next to a large window that looked out over the street, from which she could view neighborhood activity and see visitors as they came to the door. We came over individually and in groups to keep Risa company, first communicating with her by trying to decipher her labored and garbled speech, then by helping steady her fingers as she spelled out words by pointing to letters on a board. Eventually, we spoke to her without any expectation of a response. For a long time, I knew that the smart, talented and funny Risa was trapped inside her incapacitated body. But toward the end, even as I continued to spoon feed her ice cream and confide with her about the boys I liked and gossip about who was dating whom, I was no longer so sure that she was still there. However, it didn’t matter. It didn’t matter because Risa was still a human being created b’tzelem elohim. There but for the grace of God went I, and who was I to decide that she did not deserve to be paid attention to, cared for and loved? I’m not sure we teenagers could have articulated this in this way, but we knew it. We knew that doing this chesed was not optional, and that by doing right by Risa, we were doing right by ourselves. As we, Risa’s friends, grew up, the demands of young adulthood and higher education pulling us away, we were not able to spend as much time with her as before. She died in 1990, 14 years after her diagnosis, having changed my life and those of my friends for the better. That is her legacy. That is the powerful legacy of a young woman who could not talk, feed herself or move her own limbs. And that is why it doesn’t really matter whether Abbie Dorn can actually see her children or not. She deserves to see them, and even more so, they deserve to see her. A treasure trove of color film footage shot by American businessman, amateur photojournalist and ardent Zionist Fred Monosson has been put together into a full length documentary film. The most amazing thing about this huge amount of footage is that, not only was it filmed in color (when almost no one else could afford to own and operate a color film camera), but it was stored away in an attic in Boston for decades and narrowly escaped being thrown out. These may be the earliest (or among the earliest) moving images in color of post-WWII Europe (he shot in Berlin, liberated Auschwitz and the DP camps) and pre-State and newly independent Israel. In the post below this one, view an in-depth report from Israel’s Channel 2 News on Fred Monosson and his legacy of passion for film, history, and most of all Zionism and the State of Israel.